OK, how’d I do? I figured crispy carbs should do the trick. I posted this photo on Instagram a few months ago and am so thrilled to finally share the recipe. 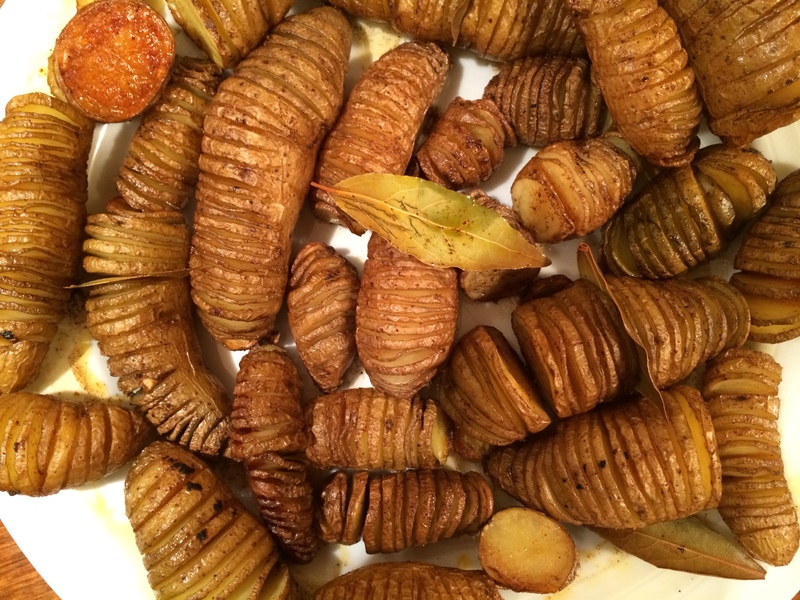 Apparently, these babies are called both hasselback potatoes & accordian potatoes and okay, maybe even sluggish looking potatoes but I call them adorable-and-delicious-potater-bytes. Eep – such a mouthful! On a bitterly cold night back in December, we served the little bytes alongside one heck of a brown sugar rubbed steak. And if you’ve been a loyal reader of Allanabytes, you know I love my steak. Mmmmm. I’m actually drooling as I write this. Probably because I had a salad for dinner. Yikes. Perhaps the biggest reason this meal was/is so appealing to me is that it combines some of my favorite ingredients: shallots, peppers, garlic, mustard with a spicy bite, brown sugar, butter, medium-rare sirloin and of course, perfectly roasted taters. Mmmm, yes, I love it all. Thankfully, all of these flavors just work – although I may be one to argue that when you combine butter, meat and carbs, nothing can really go wrong. So please, do hold me accountable for when your taste buds EXPLODE WITH FLAVAH after one bite of this dish. You can thank me in caramelized onions. And Instagram likes. 1. In a bowl, mix the paprika, brown sugar, 2 teaspoons of salt & 1 teaspoon of pepper. Pat mixture all over meat. 2. In a small skillet, heat the olive oil over moderate heat. Add garlic, shallots and capers and cook until softened, about 3-5 minutes. Stir in the sage (or other herbs) and cook for 1 more minute. Add peppers, mustard and Worcestershire; simmer over moderate heat for 15 minutes, stirring occasionally. 3. Light a grill or preheat a grill pan. Grill the steak over moderately high heat for about 12 minutes, turning once, until an instant-read thermometer inserted in the thickest part registers 130 degrees for medium-rare. Let the steak rest for 5 minutes then slice (against the grain!) 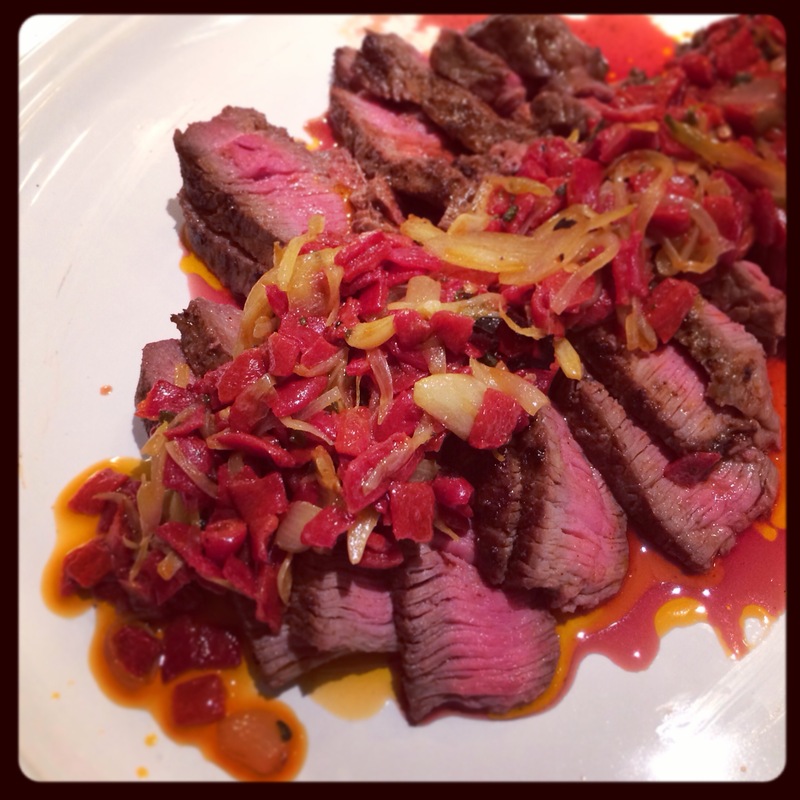 and serve with the piquillo-pepper sauce. 2. Using a small, thin knife (a paring knife would work best but use what you’re comfortable with), cut the potatoes crosswise into thin slices, stopping about 1/4 inch before cutting all the way through. 3. Place potatoes on a rimmed baking sheet and use your finger to press down and gently fan out the slices in the potatoes. Drizzle potatoes with a slug of olive oil or brush olive oil on the potatoes so they’ll get nice and golden brown while cooking. 4. Place in the oven and roast for 25-30 minutes until potatoes are crispy and golden brown. Remove potatoes from baking sheet, garnish with herbs if using & enjoy. Oh and this is matt writing from my group blog. You probably could have guessed. i live for steak and potatoes! I like your style girl!